Matching up with the ever increasing requirements of the customers, our company is engaged in providing Water Turbine Runner. Turbine is one of the leading companies in the Indian power generation sector providing cutting-edge power and energy solutions with a commitment to deliver tailored technology that is powerful, efficient, competitive, and easier to maintain. This Hydro System is widely used in different regions and highly appreciates for its quality working. Its unique Hydro Lighting mechanism provides effective working of the product for a long period of time. Leveraging on the skills of our professionals, we have developed small scale Water Turbine based on Archimedes Screw Principle. These Water Turbines are suitable for low level and small size water canals. Products are available in market at most reasonable prices. Hold the water turbine under flowing water and electricity is generated. Water is a renewable resource that is an important source of electricity. The potential energy of water is harnessed to produce mechanical energy which can be used directly, or used to generate electricity. Age group 14 to 18 years. Size approx: l: 8" - w: 6" - h: 6". Pelton turbines are impulse turbines. 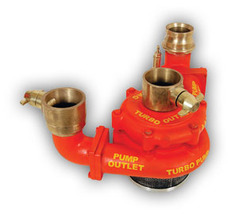 These are generally used for sites having high head and relatively low discharge.